You don't have to be a pilot to know that low flying in mountain valleys is fun. Anyone who has seen high-performance jets ripping through mountain passes will have correctly guessed that it is challenging and exciting stuff. Artist and former RAF pilot, Michael Rondot, remembers his favourite place in North Wales. “I flew the A5 pass many times in Hawk and Jaguar aircraft. For me it has a mystique unlike any other place in the UK. 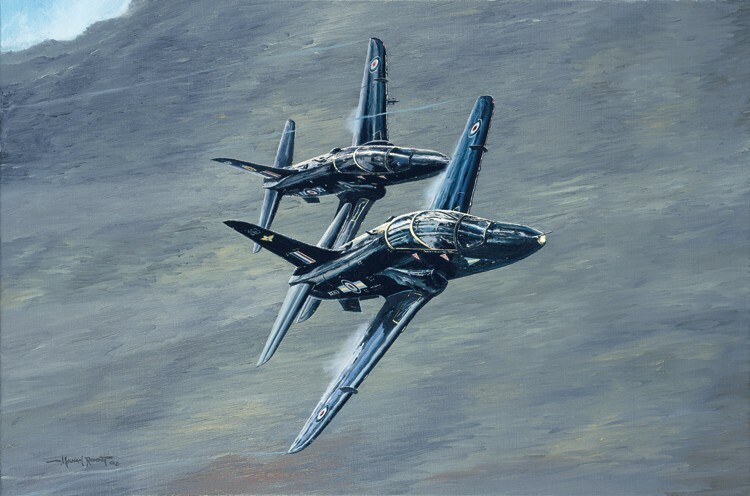 The best students at RAF Valley got the chance to fly the A5 pass in formation just like these two in my painting, but I dare say the instructors in the back seats are doing the flying." Each edition is signed & numbered by the artist, a former RAF pilot, Michael Rondot.